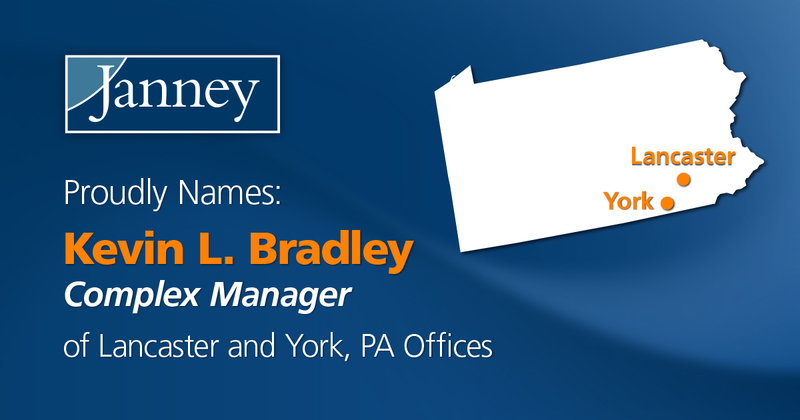 PHILADELPHIA, PA – January 26, 2017 – Janney Montgomery Scott LLC (“Janney”), a leading full-service wealth management, financial services and investment banking firm headquartered in Philadelphia, PA, today announced that it has named Kevin L. Bradley as Complex Manager of its Lancaster and York, PA offices. Jack Grim, who previously served as Branch Office Manager in York, will remain at Janney as a Financial Advisor and Executive Vice President/ Investments. Kevin joined Janney in 1990 and was promoted to Lancaster Branch Office Manager in 1993. Kevin’s numerous awards include Janney Branch Office Manager of the Year (2014) and being named “On Wall Street” Top 100 Branch Manager (2009). He has served as the Branch Manager Leadership Council Chair (2012-2014) and served on the Janney Montgomery Scott LLC board of managers (2012). Kevin has been a Board Member of Compass Mark since 2011, and has also served on the Board of the Donegal Athletic Club. Jack Grim, Executive Vice President/ Investments with the Grim & Carrolus Group, joined Janney in March 1991 as Branch Manager of Janney’s York office, and has been in the financial services industry for over 30 years. Jack is a 1973 graduate of Pennsylvania State University and is a former Lieutenant in the Pennsylvania National Guard. He will continue at Janney as a Financial Advisor with his focus on wealth management and retirement planning for his clients.